July | 2010 | Oh! What a wicked web we stitch! Just finished my last skein. For this one I hand carded some fiber. It was a mix of navy blue and turquoise superwash, natural white wool, white nylon and dark and light blue mohair. Not sure how many rolags I made but it had to be at least sixteen or so. I had three left over. Anyway, I spun it up. It’s a total of 166 yards. I am planning to use the yarn in the design of the soon-to-be Etsy shop banner. I was trying to go for an ocean feel. The dark colors for the deep ocean, the medium for the shore and the white the waves. I don’t know if it was so successful. 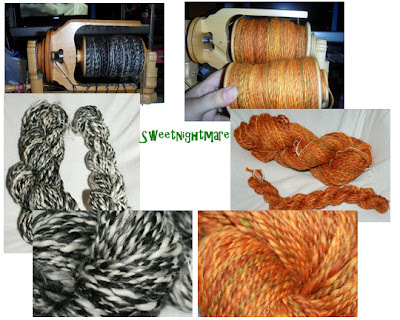 I think it certainly turned out the way I wanted when I carded it but when I spun it I didn’t get the result I had pictures in my mind as yarn. Oh well.. either way it turned out nice! Woohoo!!! The Tour De Fleece has started! I totally forgot it and only started three days ago (not too late), but I can’t believe that I already won something!!! I posted to the random prize thread and I was picked! So happy!! Ashamed though that the photo I had was so horrible. Yesterday I was spinning some black and white mill ends and just took a quick snap of what I had on the bobbin (first picture to the left). In other news, still have not opened my Etsy shop. It is still being set up. This week I’ll be taking some high resolution photos (like the ones above). It should be open at the end of the month or beginning of August, fingers crossed. I also might be abandoning this blog to open up a new one with the Etsy shop name, so stay tuned for that.